Blending together zest-filled orange with sharp ginger, each bite of this chocolate packs a kick of delectable flavour that superbly complements the strong dark chocolate. This 70% chocolate delight was made using high-quality cocoa beans sourced from the Kupa Kokoo co-op unon based in Ghana, giving each bar the official seal of certification from FairTrade. This chocolate supports fair and ethical treatment for workers and leaves palm oil out of its recipe as to not contribute to the mass deforestation caused by the palm industry. Fairtrade cocoa mass, Fairtrade sugar, Fairtrade cocoa butter, Orange granules 10%, Emulsifier: soya lecithin (non GM), Natural Ginger Flavour, Fairtrade Vanilla. Suitable for vegetarians. Free from articifial flavourings, colourings and preservatives. Manufactured in an environment where nuts, milk, wheat and gluten may be present. The Divine 70% Dark Chocolate with Ginger & Orange - 90g product ethics are indicated below. To learn more about these product ethics and to see related products, follow the links below. 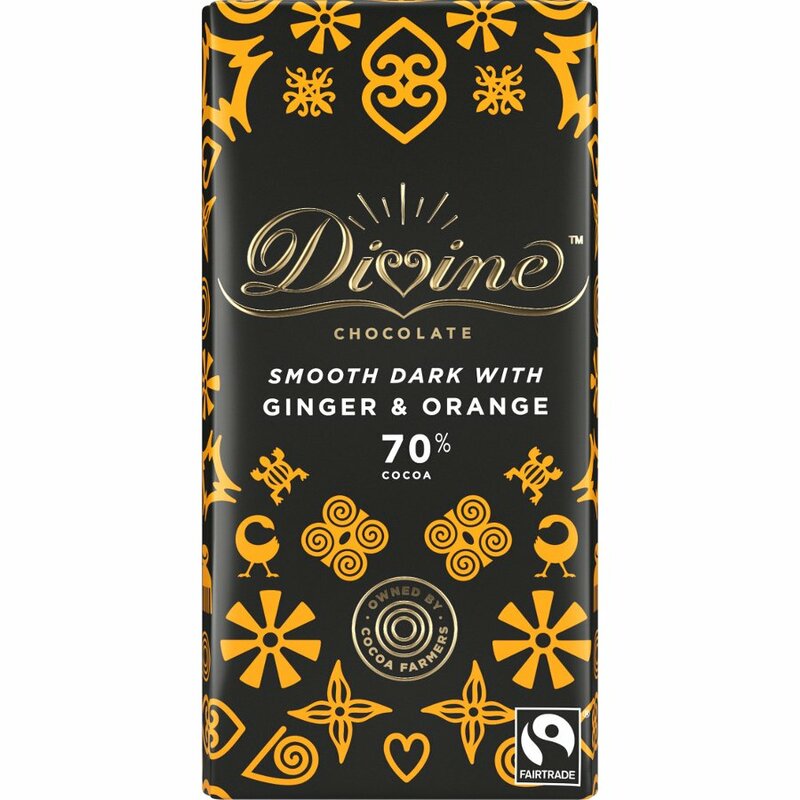 There are currently no questions to display about Divine 70% Dark Chocolate with Ginger & Orange - 90g.